I am an avid user of Google's Reader product. I find it the easiest way to stay caught up with my favorite blogs and to keep them organized. Sometimes the comments on a blog are more interesting and more useful than the blog itself. Maybe you want to follow the comments on your own blog more closely. I recommend SUBSCRIBING to the blogs comments via Google Reader to accomplish that. (You may need to scroll down to Add Blog to Google Reader which is an important first step to this whole process and I assume you have already done). Step 2: Copy the URL for the feed and click the big red SUBSCRIBE button. Paste the URL into the box, but change the word POSTS to be COMMENTS. The feed will be added to the Blogs I'm Following folder, you may want to rename it so you can tell it is comments, instead of the regular feed. 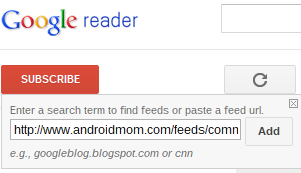 There are two easy ways to use Google Reader to read blogs, in case you need help with that first step. 1.) If the blog you are reading has a Google Friend Connect button, join it. Then log into http://reader.google.com and all new posts are automatically added under "Blogs I'm Following". You can reorganize them into groups that make more sense to you. 2.) If it does not have the Google Friend Connet, then from within Google Reader choose the big red SUBSCRIBE button at the top of the page and a box will open. Paste in the entire main URL for the blog you want to follow. Note, not every blog has a feed! For example for this blog that is www.androidmom.com, reader will find the proper feed address based on that. The blog will be added to the list of Blogs I'm Following, you may have to search around for it a bit. I also set my FEED SETTING to show on NEW ITEMS, as opposed to ALL ITEMS. But the great thing is that when I need to search all the blogs I follow, it will search all of them and the unread posts will be highlighted. 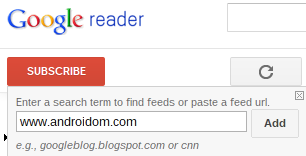 Searching through all the blog is just one of the really great advantages of using Google Reader! I know I read about a recipe, but can't remember who posted it, so I just search for "Eggplant" and it will list all the posts I subsribe to with Eggplant mentioned. How great is that?